As a digital marketer, you are likely to have come across the term SEO (Search Engine Optimisation). In short, it is the way you set up and optimise a website so it features higher on a search results (e.g. Google). There are lots of ways you can improve your SEO - too many to add into a single article! This week, we will focus on something called SERP - what it is and how you can perfect it for your school website. It is possible to influence all of these possible results using best practice techniques around SEO. Search Engines are incredibly complex tools that use algorithms to determine the results you see. All algorithms look to return the results the user would most want to see, and utilises data to personalise it as best as it can. Keywords: the words on your site's pages will have a large effect on what a search engine will turn up. You want them to align well with what people will search for when looking for your school. For example, if you are a preparatory school in Bath these are likely terms people will search if looking for a prep school in your area. If these keywords did not feature anywhere on the site you are reducing how high you are likely to be rated on a search. Domain authority: A higher "domain authority" will rate higher because a search engine knows that these are more trusted sites. A good domain authority in essence will be a site that sees a high level of external links (from other trusted sites / platforms) to and from the site. Wikipedia and social media are effective ways to help increase external links to your site. Your location: Search Engines will use location services to determine where in the world you physically are and deliver results that relate. If you search for just "prep schools" the results that come back will likely be prep schools close by. Browsing history: Your browsing history will also impact SERP, and it is often one of the ways that subtle differences begin to come through even when two people search the same term from the same location. Modern SEO has one important rule: write for the user first and the search engines second. The better the quality of the content, and the more value it gives to the user, the more they will see, use and engage with it. Applying best SEO practice to your school website and its content will certainly help improve SERP. Additionally, here are four SERP features you should know about and take advantage of (note: these all relate primarily to Google as it is the world's largest and most influential search engine). The Knowledge Panel / Graph is Google's way to provide as much detail as possible without a user needing to go to a website. Through best SEO practice, your site's Knowledge Panel should populate organically. All of this takes time! Don't expect a Facebook account you set up for your school last week to feature just yet. Google won't be rating this channel as a good source just yet. Further down the line however, and with good school website referrals from and to this Facebook channel, then you are more likely to see it feature. If anything in the Knowledge Panel does not look right, or information is wrong, you can report back to Google to adjust. Featured Snippets feature at the top of a SERP, and will feed back information directly related to the search term. This can be invaluable for schools that have taken the time to ensure their sitemap and SEO is of a top quality. 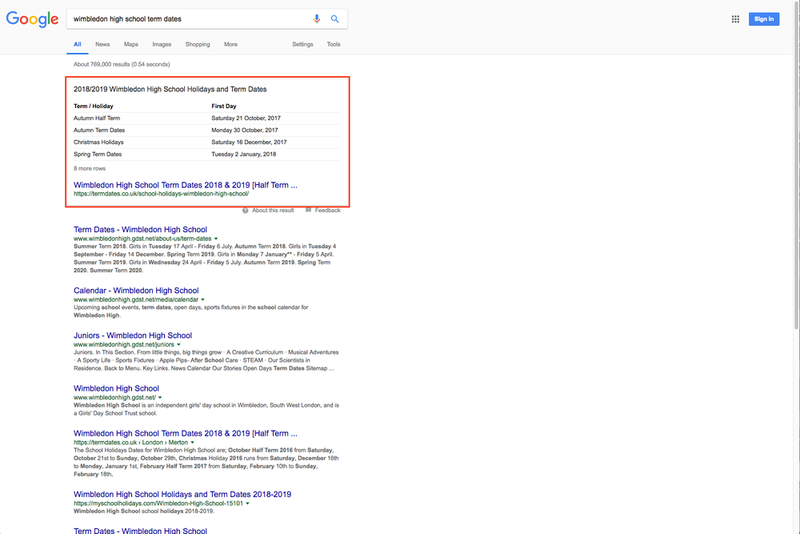 In the example above you can see that a search result for "Wimbledon High School term dates" has returned exactly the information requested. As with Featured Snippets, a school website that has quality SEO and site map will likely show Sitelinks in a SERP. These are hyperlinks to a site's subpages;. Typically, these are based on popularity - term dates may be a highly visited webpage on your site, so this has more likelihood of showing in Sitelinks - but can also change depending on your search term. 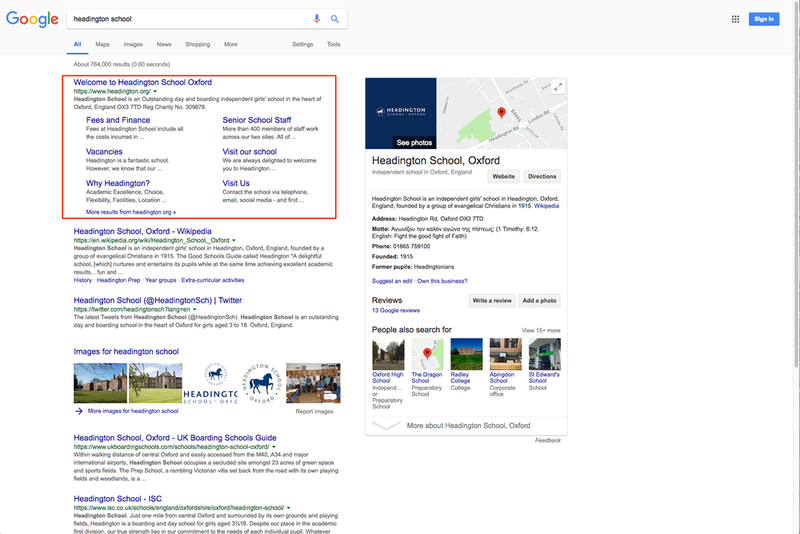 The above Headington School SERP shows an organic set of Sitelinks. The final SERP section that is worth noting (and of course can be relatively controlled by the school) is Live Twitter. This SERP feature will pull through real Tweets from the account Google can see is directly linked to your website. Take a look at the JESS Dubai example to see. This is not limited to Twitter! 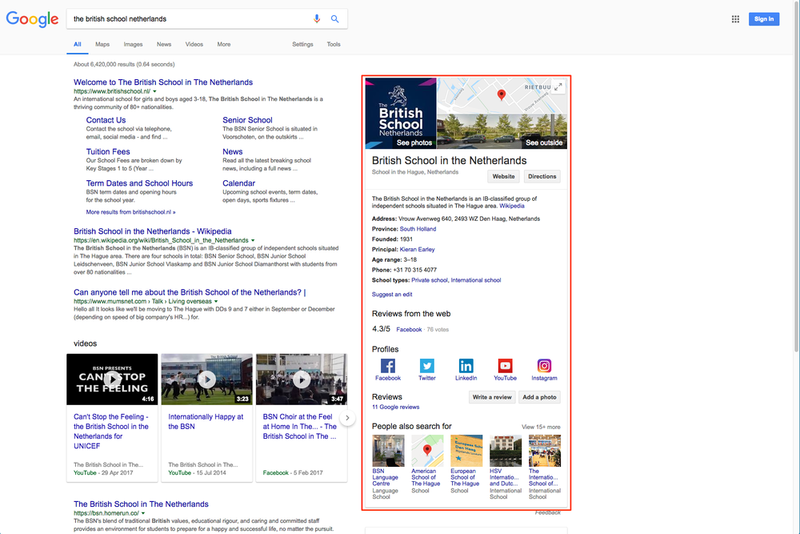 It is also possible for a SERP to pull through video content from YouTube - which can be seen in The British School in the Netherlands example further up. Understanding your social media presence and how it ties into your website will help dictate this more effectively. Not sure what a snippet is still, or how you can feature videos on a SERP? We can help! We are experts in SEO and the impact it can have on your website. If you would like to discuss what advice and services we offer, please do contact us. Have you tried Googling your school website recently? What does an "organic" SERP show (try using incognito mode on your browser to make results more organic)? Does this article make you rethink how your website really rates on Google and search engines? We'd love to know - please comment below.